For all of the grandest moments in our National Pastime's glorious history, sadly enough, the one that has left one of the most indelible marks on the game itself is the unparalleled legacy of the immortal 1919 "Black Sox" Scandal that absolutely "rocked" the baseball world. The "Faith of Fifty Million People" was originally compromised when Chick Gandil was approached by an Arnold Rothstein sponsored Chicago thug with the intent of "paying off" White Sox players to "throw away" the 1919 World Series against Cincinnati, and after Gandil met seven of his teammates at the distinguished Ansonia Hotel on September 21st to promote his idea, the "fix" was in. Prompting some of the players to accept such a dishonest arrangement were the deep pockets of their beyond "cheap" owner Charles Comiskey who actually initiated the "Black Sox" nickname in 1918 by continuously having his players don dirty uniforms to avoid excessive laundry bills. The names of the" infamous eight" will echo for eternity: "Shoeless" Joe Jackson, Buck Weaver, Ed Cicotte, Chick Gandil, Claude "Lefty" Williams, Swede Risberg, Fred McMullin and Hap Felsch. The stories behind the "fix" still linger on including: a young boy yelling to Shoeless Joe Jackson as he walked out of a court room "Say it ain't so Joe"; did Weaver or Jackson actually throw games considering their affluent batting achievements; should Judge Landis have banned all eight players from baseball forever after they were found not-guilty in a court of law? The list goes on and on, with a significant level of ambiguity still residing over many of these issues. One thing is for certain, the sour taste this incident left on the game will forever reside within baseball purist's hearts; an unequivocal "black mark" that will eternally be linked to baseball's storied past. Due to its incredible stature, a myriad of advanced enthusiasts continuously pursue various "Black Sox" collecting angles including assembling baseball cards of the infamous eight, 1919 World Series programs, autographs, ticket stubs, photos, etc. While locating ticket stubs is a challenging task, the one "ticket" related item that is a near-impossible find is the 1919 Chicago White Sox celluloid season pass that is arguably considered by many hobbyists as one of the rarest of all celluloid passes. With that in mind, we at Memory Lane are proud to present this astonishing 1919 White Sox Celluloid season pass that has remarkably retained a majority of its original factory issued qualities. A diminutive artifact of epic proportions, its stands as a bona-fide cornerstone to one of the most iconic baseball seasons in baseball history, and its paucity level is virtually second to none! Measuring approximately 2-1/4" x 3-3/4", and its originally issue rounded corners made it a perfect fit for the standard wallet. This particular ticket was issued to a Leo A. O'Neil with his name boldly scripted in period style black fountain pen. A classic Comiskey Park light background image is affixed to the center of the pass, with the top portion reading: "Chicago White Sox Extends to." Beneath Mr. O'Neil's script reads "The Courtesy of Comiskey Park," and the lower portion includes a facsimile C.H. 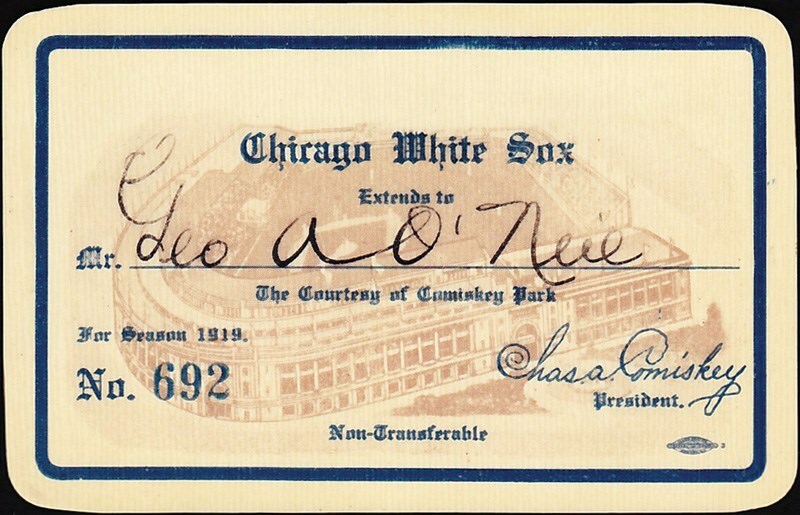 Comiskey signature as well as "For Season 1919" and "Ticket No. 692." 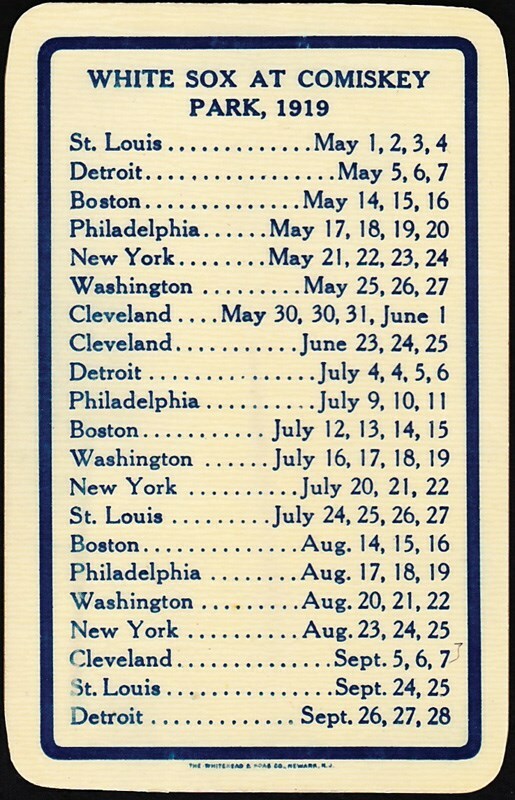 The verso reveals the Chicago White Sox's home 1919 home 70-game schedule with both sides exhibiting no glaring surface flaws whatsoever and exceptionally fine perimeter edging. Incredible as its sheer existence stands, the condition is likewise amazing. More significantly, it represents an iconic season when the Chicago White Sox would turn the baseball world upside down via the assumed guilt of eight momentous players including the immortal "Shoeless" Joe Jackson. In light of our esteemed judicial system, we will never know with 100% certainty whether all eight players were guilty of throwing the 1919 World Series, especially considering all eight players were ultimately acquitted in a court of law. Yet, their "alleged" guilt was enough for Judge Landis who in 1920 forever banned all eight players from playing professional baseball and declaring: "Regardless of the verdict of juries, no player who throws a baseball game, no player who undertakes or promises to throw a baseball game, no player that sits in conference with a bunch of crooked gamblers where the ways and means of throwing a game are discussed and does not promptly tell his club about it, will ever play professional baseball". Baseball history was now carved in stone, with the entire scenario now belonging to the ages. In lieu of the 1919 "Black Sox" scandal's immense historical significance, we cannot imagine a more fitting testament for that momentous occurrence than this ultra-rare 1919 celluloid season pass that stands as a perfect representation of that fabled season!